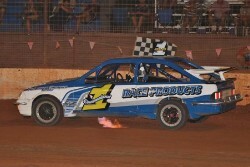 Tim Weir has successfully defended his Queensland National 4s Title at the Shed Alliance Bundaberg Motorplex on Saturday night, comprehensively winning the 40 lap main event, and in the process almost lapping the entire field. Weir, who had won the title twice leading into the event would start the A Main beside Frank Packer, after nine qualifying heats were contested. Weir would get the perfect start, leading Packer, Dennis Shallcross and Hayden Turner through the opening laps. Shallcross would rollover on lap six, the only stoppage of the race, with his car severely damaged in the process. After the stoppage, Weir took complete control of the race as Turner moved to third and Andrew Pickering to fourth after starting from the fifth row. Pickering moved to third at the half way mark, as Weir started lapping traffic. Brock Hancock and Hayden Turner would trade fourth place through the middle stages of the race, as Weir continued to drive away from the field, ultimately lapping up to fifth place. The battle between Hancock and Turner went right to the end of the race, with Hancock getting the upper hand late, while Pickering closed on Packer. Meantime Weir was three quarters a lap in front and cruised to his third State Title victory. Packer, Pickering Hancock and Turner would be the only other driver left on the lead lap.